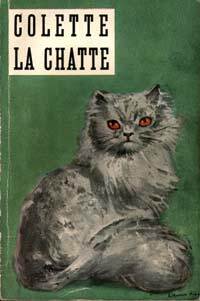 I’m so pleased that I actually found a picture of the old 60s paperback of La Chatte that I bought second-hand a few years ago. These old Le Livre de Poche editions have such an incredible charm. The book is available in English as Gigi and The Cat which is very misleading as Gigi is an independent story in its own right as much as The Cat and pairing them like this sounds as if that was the book’s title. I realised this when reading the review of the two books on Literary Relish’s blog. Reading tastes change, at least mine do, but some authors will always remain favourites. One of those authors who is special to me and has always been is Colette. She is such an accomplished writer, a masterful stylist, a great storyteller and a psychologist of superior order. She can take a story that looks simple and nondescript and turn it into a complex piece of writing, revealing the numerous layers of motives and motivations behind actions. Her descriptions of people and settings are some of the best I have read. Her vocabulary is selected and she tried to find the exact and appropriate expression at any moment. Still there is no superfluous word or unnecessary adornment in her writing. La Chatte is no exception. It has a subject to which I relate but it is far more than the story of a relationship between a man and his cat. It is a subtle analysis of love versus passion, of marriage versus celibacy, of childhood and growing up, of change and permanence. The story also captures the dynamics of disenchantment following the recognition that one’s object of desire is flawed. The story is simple and can be told in a few words. Childhood friends Alain and Camille are going to be married. The lively and insensitive Camille is looking forward to her new life but Alain, who has to leave behind his beloved cat and the home of a happy childhood, is not as joyful as the bride. The relationship he has with the Chartreux cat Saha is very intense and emotional. They share rituals and habits and are deeply attached to each other. The cat doesn’t like Camille and the young woman thinks her future husband is slightly silly when it comes to the animal. The newlyweds are meant to live at the old house with its splendid garden but at first they move to a friend’s apartment while Paul’s old rooms and the family home are being transformed into a bigger apartment for them. Paul cannot adjust to his new life and sneaks off to his parents’ house frequently. Whenever he returns the cats looks thinner and thinner. She misses him and doesn’t eat anymore. Finally he takes her with him to his new home. To make things easier for the cat and his wife, Alain tries to teach her the cat’s ways but Camille couldn’t care less. What unfolds is a story of jealousy and hatred between Camille and Saha. It is an uneven fight, shocking at times. Most of it happens behind Alain’s back but in the end, after something horrible has occurred, he notices what is going on. Camille’s reactions to the cat and the way she treats her opens an escape route for Alain and tells him a lot about his wife that he hadn’t seen before. I really liked Alain who is a dreamer and so unprepared for married life. He is an only child of very rich parents and the beautiful family home is stately and imposing and so is the old garden. One of Alain’s and the cat’s biggest joys is sitting quietly on a chair, watching birds, smelling the flowers and do nothing else but contemplate their surroundings. One wonders what motivated Alain to get married in the first place. He was so content before, enjoying a life of leisure. He shares everything with the cat apart from a sexual relationship which seems the only reason why he let Camille sweep him away into marriage. He realizes that he doesn’t need to be married to get what he needs. He can always have girl-friends. The deep affection he and the cat have for each other is very touching. Colette loved cats but I think the cat could be replaced by a friend or a brother, a sister, anyone with whom one wouldn’t have a sexual relationship. I think Colette also shows that love in its purest form can come from many sources. La Chatte is a novel full of beautiful descriptions and the tension that slowly builds up between the two rivals makes this a very engrossing read. I read Colette’s novel as a contribution to Book Bath‘s and Thyme for Tea‘s event Paris In July. I think I have known a few men who would pick a cat over a wife! Thank you for your review. I’m visiting you back as part of the Paris in July tour. You are welcome and thanks for visiting. I don’t think I ever met a man like Alain. I haven’t read La Chatte for years, but I remember it as being a good one. Who on earth could write a story about a love triangle between a man and his cat and his wife, and make it not only plausible but a bit spine-chilling. Only Colette! I knew her writing but still was a bit wary before reading it. I love cats but… There was no need for that. She is one of the very great, there is no doubt about that. I didn’t want to give too much away but I was seriously shocked at one moment. Spine-chilling indeed. That is a beautiful cover. And the book sounds very interesting. I just love these covers and am glad I found 20 of them in a shop a couple of years ago. They would have been thrown away! It is a great story but you can pick anything by her, she does not disappoint. I can understand Alain as well, I have a very similar relationship with one of my cats. I love the sound of this story. I have a stack of novels by Colette, but not this or Gigi–and too many still unread. I will have to look for a copy. I always think of cats and women rather than cats and men, so this so I’m very intrigued. Like Pamela, I knew more men with this type of relationship with their cat that women although, in general. It’s a suprising story, really. I haven’t read Gigi but I’m sure it is good as well. I saw a play last year that was similar to this called, Sylvia, except it was a dog that was the source of trouble between the married couple. The dog was played by a woman, and it was sort of weird. I think I would like this book better. I’ve never read any Colette, would you recommend this one or Gigi first? I haven’t read Gigi yet, I read some others. I think this is one of my favourites but I also like her short stories, “Three, six, nine” (It’s a title) and “Ripening Seed” are great too. If you get The Cat you will get Gigi too. All of her novels are quite short, under 200 pages. I’ve never read Colette but you made me want to try her. Which one do you recommend first? ps : thanks for the old cover it brought me back to my mother’s paperback collection. They were all in my room. I’m glad. I love these covers. My father got tons of them. Knowing you are not too keen on cats… No, you could start with this one anyway. My favourite is La Lune de pluie but Le blé en herbe is good as well, and so are Bella Vista and Le pur et l’impur (which I need to re-read). Thanks. I like cats if I had to choose a pet, I’d get a cat. I’ll have a look at your recommendations. I seem to have misunderstood. Cats love readers and writers, quiet occupations but they also enjoy you watching when you do something as long as it isn’t too noisy. I’m curious which one you will oick, should you read her. What an impressive review, Caroline. I would love to read this. Of course you know how much I love my baby turtles, I have even vowed that if I found a husband one day…he better NOT saying that I cant keep my turtles as people often think turtles bring bad luck. I totally understand how the man’s feel about the cat. I’ll choose Kame and Kroten over any man. Thanks, Novia. Maybe you could find it in a library. I didn’t know people think turtles bring bad luck. It is so well written, all the little details about the cat, the observations, you know she loved cats. I would never abandon my cats. I can also relate to the feeling of love. The problem with cats is that they can be very jealous and if they are attached to someone they tend to not let other people approach them. This could make things complicated. Not sure a turtle can show she dislikes another human? I know how jealous can a cat be.i read it as Sara’s blog. Female cat with male owner is the worst. I don’t think turtles are capable of such complicated feeling.I know kame and Kroten are jealous at each other but I doubt they will also jealous at other people. In my case it is the male cat who is extremely possessive and jealous of her and of people as well.She doesn’t let anyone else touch her but she isn’t really jealous. I’m a little embarassed to admit I’m not familiar with this book. I haven’t read anything by Colette but she’s on my list of authors to be sure to read. I’m intrigued by her writing particularly as you described it. I certainly want to read about the relationship between the man and his cat although I’m sorry his wife turns out to be quite jealous. I have known a few men like the man in the story and a few women like the woman. None of them married each other, though! Thanks a lot Amy. Do try Colette, she writes such wonderful books. I’m sure you would be delighted how she describes the cat but also shocked about what happens. The relationship she describes sounds very familiar. I think it would be quite a problem if you own a pet and your partner wouldn’t accept it or, the other way around, the pet wouldn’t accept the partner. Woo hoo! I’m glad you loved this as much as I did. The 1960s cover is just great and is exactly how I imagined Saha. What a great review. Thanks a lot, Relish. I really did like it. I’m glad I saw the double title mentioned on your blog… I felt a word of warning was needed. These covers are so lovely and I think it does capture her personality rather well. I need to read Gigi too. I also have one of those 60s paperbacks. I have just started to read this book, this being the first of Colette that I have started, I am a student of French and do find her use of the language very difficult for me, but I will conquer it ! That’s good. I hope you will like it. I abolsutely love her but you are right, she isn’t the easiest of writers, she’s far more complex than people usually think. Le blé en herbe is a bit easier as far as I remember.